In every post in the Top 10 List we try to do something new and different. We hope our post of Top 10 List will help you to extend your general knowledge. This time in our Top 10 Listwe are going to put a post about Top 10 List of longest road in the world. We hope that our audience will know something new from this list. 1. Trans Canada Highway: In this Top 10 List we keep this in the 1st place. 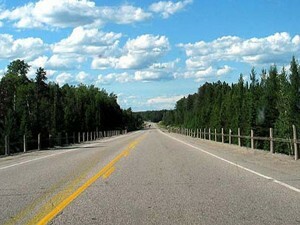 This highway has a length of 4860 miles in Canada. This path begins on Vancouver Island, British Columbia and across the Continental Divide, 10 provinces, five time zone and ends in St. John’s, Newfoundland. This road was built in 1962 and completed in 1970. 2. The Trans Siberian Highway: In the Top 10 List the Trans Siberian Highway is in the 2nd position. The Trans Siberian Highway includes some federal highway that extends throughout Russia from the Baltic Sea from the Atlantic Ocean to the Sea of Japan in the Pacific Ocean. The length of this road is 11000 km. 3. Route 6: Route 6 is in the 3rd place in our Top 10 List. Route 6 was founded in 1925 extended from Province town, Massachusetts, to Brewster, New York. Then it referred to as the “Roosevelt Highway,” the name given to the entire Route 6. 4. MacDonald Cartier Freeway: In the 4th place we should keep MacDonald Cartier Freeway of our Top 10 List. It is one of the busiest highways in the world. This road is located in the center of town was built on the side of the country although initially. 5. Interstate 90 (I-90): In the 5th position we put the name of Interstate 90 (I-90) of our Top 10 List. The longest Interstate Highway 90 in the United States, this highway extends to 3,099.07 miles (4987 km). It crossed the Continental divide just east of Butte, Montana. 6. Interstate 80 (I-80): In the Top 10 List of longest highway we keep the name of Interstate 80 (I-80) 6th place. Interstate 80 (I-80) is the second longest after the Interstate Highway 90 in the United States. This road connects downtown San Francisco, California, to Teaneck, New Jersey. 7. Australia‘s Highway: In the Top 10 List of longest road in the world we put the name of Australia‘s Highway in the 7th place. It is the longest road in Australia. Australia’s Highway 1 is a network of highways that surround the entire continent of Australia, joining all mainland state capital. Every day there are more than one million people travels on some part of this way. 8. Pan-American Highway: In the Top 10 List of longest road in the world we keep the name of Pan-American Highway in the 8th place. The Pan-American Highway route in North America is part of a network of nearly 48 000 km road journey through the American mainland countries. 9. The Tarim Desert Highway: In the Top 10 List of longest road in the world we kep the name of The Tarim Desert Highway in the 9th place. The Tarim Desert Highway is also known as the Cross-Desert Highway (CDH), across the desert is not too long from north to south. This highway connects the city Luntai and Minfeng in south and north edge of Tarim Basin. 10. Highway 409: In the Top 10 List of longest road in the world we keep the name of Highway 409 in the 10th place. It is a short highway that is used primarily as a bypass for traffic approaching the airport to the west or north of Highway 427 from Highway 401 west.